Protothaca stamenea range in size from 4cm to 6cm. Predominantly white and or combination's of brown, tan sometimes with brownish markings. Oval in shape and plump with thick valves with radiating and concentric ridges extending across the entire outer shell. Native little necks release planktonic gametes from April through July. The larval stage lasts for 3 weeks or longer in cooler water. As veliger larvae they search the bottom before metamorphosis and then move from deeper water to shallow water to live there life. Reproductive success gets determined at larval stage with the post larval stage being highly variable with many factors both environmental and human caused factors. Native little neck clams are abundant throughout Puget Sound and Willapa Bay and Grays Harbor, but are almost entirely absent throughout Strait of Juan DE Fuca and are in evenly distributed where they occur. Their primary habitat is the intertidal and shallow sub-tidal zone. Common substrate types is cobble or gravel mixed with sand or mud and broken shell. There are two very similar species that are often confused when trying to identify the species. 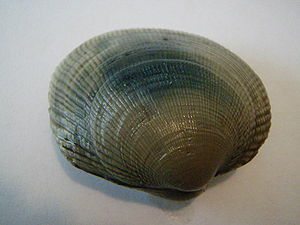 The nonnative manila clam (Veneruptus Philippinarum) is easily confused with native little necks due to similar habitats. Manilas are usually found higher up in the intertidal zone and closer to the sediment. The other similar species is the Butter clam (Saxidomus Giganteus). They are found closer to the mean low tide line and deeper in the substrate to 30 cm down and are mostly confused with native little necks as juveniles until they reach their adult size. Native little neck clams make up part of the 100 million dollar shellfish industry in the Puget Sound region of Washington state. The majority of the clam harvest will be sold whole sale to restaurants and smaller amounts being sold to seafood markets throughout the region and country. This page was last modified on 8 March 2011, at 20:12.